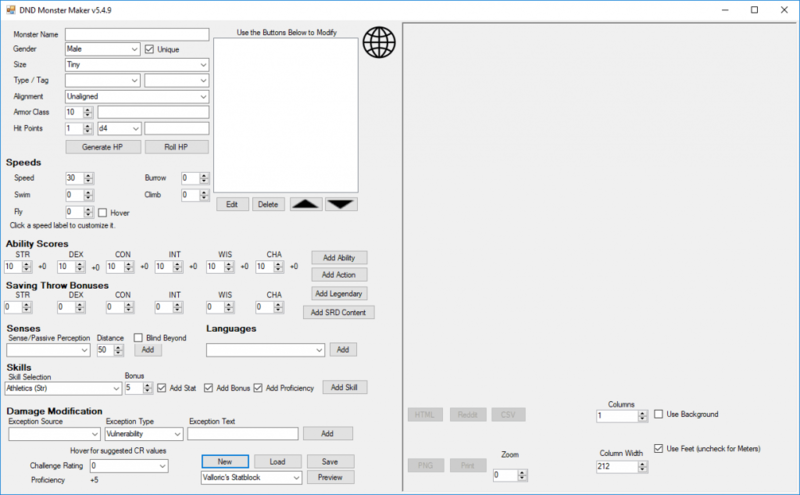 This post has been updated a bit to show current screenshots of D&D Monster Maker and provide new information based on changes made to the program since this post was originally written in 2015. I’ve kept the majority of the content the same besides some clarifying changes and editing. I’ve mentioned before that I’m gearing up to DM for a larger than recommended party for D&D within the next two weeks. We ran a custom, combat heavy, one-shot as a test run because I wanted to try a few things out with them, particularly how combat would work in such a large group. One of the things I wanted to test in this quick one-shot was my ability to make custom monsters. I tend to throw in a big boss creature in most dungeons; partly because it’s my style and partly because everyone in the group is an avid gamer and tends to enjoy the big boss fights. A while ago on Reddit there was a thread advertising a free software that allowed you to enter stats, skills, abilities, etc. for a creature. You can download this program, D&D Monster Maker, here. This link currently points to a dropbox link as there seem to be some issues with the D&D Monster Maker download page. When we open up D&D Monster Maker we have a screen that is devoid of pretty much any text. You can either fill in the text boxes manually or opt to use the drop-down menus when applicable. It’s great because it allows you to automatically calculate things like HP bonuses and attack/damage bonuses based off of your stats. There are a couple of errors that will pop up in this program and unfortunately basically force it to completely freeze and shut down. One of these is if you input an invalid value into a field and try to move to a different field, the whole program shuts down. I’d recommend saving your progress on a regular basis while you’re working in it. So if you click on the Add Ability/Action/Legendary these three windows will pop up. Depending on what you’re going for you’ll want to add the proper spells/custom abilities/custom attacks/custom legendary actions to the character. You have to add them one at a time, but it’s not really that much of an inconvenience as you can do all of this without closing the windows. Do not close the windows before you have clicked the Add button. Doing so will erase the work you have completed. In the picture above you can also see that you can preview the monster sheet. You can print this preview out or save it as an HTML, PNG, PDF, or CSV. You also can change the style of the sheet and load in your own style sheets. Prior to printing, you can change the formatting of the printout. You can change the number and size of the columns. There is also an option to change feet measurements to meters though this is not a conversion. 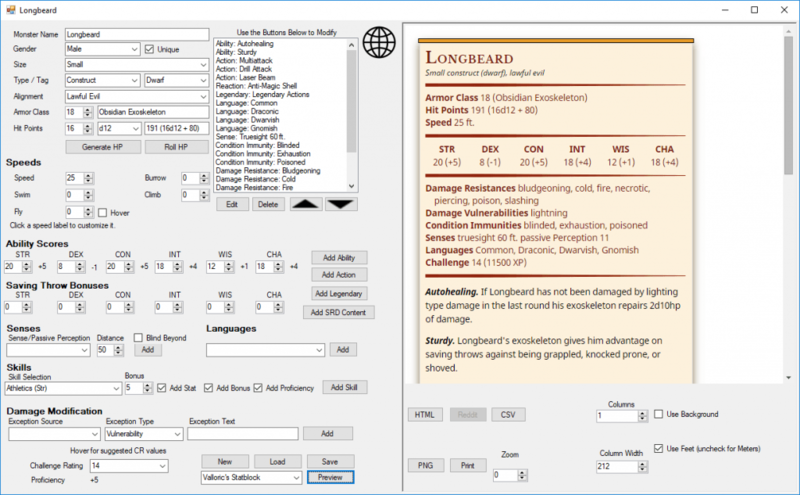 After a few updates, D&D Monster Maker has become one of my most-used D&D 5e tools since I first wrote this post in 2015. I love using it for creating new creatures and boss monsters. There are many options such as The Homebrewery that will allow you to create a formatted monster stat block. D&D Monster Maker takes care of all of the formattings for you so you can focus on creating an interesting creature. I love using both of these tools, though, so I tend to use D&D Monster Maker for quick and dirty drafts and Homebrewery for finished products. They work very well together in my opinion. It’s also free to download so be sure to give it a try! Thanks for the kinds words! I’m pretty active on Reddit and oddly Google+ so if you find any bugs/freezes with errors, send them my way and I can zap em! One thing I’ll note, please ensure that .net 4.0 (minimum, I prefer 4.5 but that killed it for XP users) and C++ distributables are installed! I’ve had some people able to use the program but have Black PNG files get generated, and that’s why. 1The download link is currently displaying a “This domain name has expired.Click here to renew.” error. Is there a mirror? Was I too late? Thanks for the heads up, their site appears to be down. I will look for an alternative link in the meantime. I just updated the post with a new link to a .zip folder that contains the program. Thanks again for alerting me about the site issue! Link not working again, please link the dropbox file please. Seems to be down. Takes me to a HTML saying the XML file does not have information associated with it. Yes, unfortunately their website still seems to be having issues. The dropbox folder I linked in this post contains the same program. Just download the .zip folder and extract it on your computer. It runs fine after that! Did you extract the files from the .zip folder first when you downloaded it? I just downloaded it again and it worked fine for me. I’m using Windows if that helps. Ok, that’s probably the issue! Try downloading the .zip folder again then right click the folder and select extract all. Choose where you’d like to extract the folder and then open up the folder and open DND_Monster.exe. It should work then. Basically the .exe file needs the other files in order to work properly. You can create a shortcut for it for your desktop as well by right-clicking your desktop and selecting “new” then “shortcut”. Then select the DND_Monster.exe and you’ll have a desktop shortcut for the program. That’s very odd, try this link and see if it works. I uploaded the folder after it’s been extracted. Unfortunately I don’t believe so. I looked and there doesn’t seem to be a way to remove Cantrips from your spellcasting type. I tried it with the class set to ranger thinking that might change things, but it still showed up with Cantrips. Also I would like to ” *The paladin casts these spells on itself before combat.” under the spells but idk how to put it so it looks nice. thanks! So for this you could have an * next to each pre-casted spell and then add a custom Ability stating that the * means that the spells have already been casted on the creature. Not exactly the nicest-looking way but it does the job. Personally I would use DND Monster Maker as a rough draft in your scenario. Once you get all the mechanics nailed-down I’d use something like Homebrewery or GM Binder for the final draft to make it look nice. You can add pictures and do all sorts of custom formatting with these if your goal is a nice looking statblock! ok thank you so much for the replies! When I try to run DnD monster.exe, it loads for a half a second but the program wont open at all. Ive tried re downloading it, extracting it, and opening it through winrar and nothing works. I had the program previously and it worked fine. Now all of the sudden it wont. The only thing I can think of is to maybe try running it as Administrator. Sorry if that still doesn’t help! Unfortunately I’m not involved with the program so I’m not able to fix it on my end. Hey! Not sure if you’ll see this or if you can help, but I seem to be having some issue exporting the statblock? The PDFs come with the columns wonky and the PNG files only show the background. Thanks for your time! That’s odd I haven’t had much of an issue with it in that regard. Does it do this for every statblock style? The drop-down menu next to the preview button lets you try different ones. Might be worth a look to see if a different sheet works better. Hi ive been having a crash issue when i try to edit and ability within the legendary action screen anything i can do? Unfortuantely I have no idea. Make sure your .net is 4.0 or higher and you have the c++ redistributables installed since that can apparently cause crashing issues.